It's never dull with these three! Have a great Feline Friday! Good looking kitties they are too. They can be so entertaining. Now that's a trio of cuties! 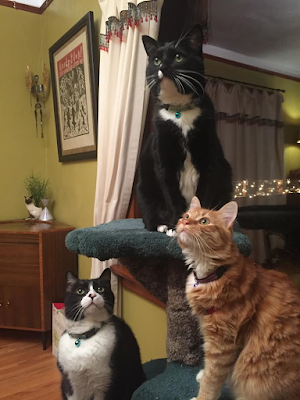 A lovely triumvirate of kitty splendor. When I first saw this picture I thought of the game 'King of the mountain'. lol Have a good weekend! All three are looking to cause trouble, you can tell. Looks like they have spotted something interesting. oh my!! What purrfectly adorable kitties those are! They are darling!! LOL i'm wondering what they are LQQKING at heheh! They look like they are plotting something. Sort of like Link.